, D. D. a learned critic and distinguished scholar, was the descendant of a family long seated at Ratcliffe Culey. a hamlet within the parish of Shepey, in the county of Leicester. His grandfather (who died in 1727, aged sixty-three) is described on his tomb in St. Mary’s church at. Leicester as “John Farmer of Nuneaton, gent.” His father, who was largely engaged in Leicester in the business of a maltster, married in 1732-3, Hannah Knibb, by whom he had five sons and four daughters. He died in 1778, at the age of eighty, and his widow in 1808, at the advanced age of ninetyseven. The subject of this article was their second son, and was born in Leicester, Aug. 23, 1735. He received the early part of his education under the rev. Gerrard Andrewes (father of the present dean of Canterbury) in the free grammar-school of Leicester, a seminary in which many eminent persons were his contemporaries. About 1753 he left the school with an excellent character for temper and talents, and was entered a pensioner at Emamiei college, Cambridge, when Dr. Richardson, the biographer or the English prelates, was master, and Mr, Bickham and Mr. Hubbard were tutors. Here Mr. Farmer applied himself chiefly to classical learning and the belles lettres, with a predilection for the latter, in which, in truth, he was best qualified to shine. He took his degree of B. A. in 1757, ranked as a senior optime, and gained the silver cup given by Ernanuel college to the best graduate of that year, which honorary reward is still preserved with great care in his family. His only Cambridge‘ verses were a poem on laying the foundation-stone of the public library in 1755, and a sonnet on the late king’s death in 1760. In 1760 he proceeded M. A. and succeeded as classical tutor to Mr. Bickham, who was at that time presented to the college-rectory of Loughborough, in Leicestershire. He proved an excellent classical tutor, and had the art of gaining the esteem of his pupils; but, having less attachment to theology and mathematics, he is thought to have | been less zealous in recommending those studies, although he never remitted what was necessary for the purposes of initiation, and more can perhaps seldom be achieved by any tutor in the short time he has to direct the pursuits of his scholars. At what time he took orders is not mentioned, but during his being tutor he served the curacy of Swavesey, a village about eight miles from Cambridge. The bent of his private studies being to ancient literature and antiquities, he was in 1763 recommended to, and elected a fellow of, the society of antiquaries. In 1765 he served the office of junior proctor of the university. In May of the following year he published, from the university press, proposals for a history of the town of Leicester, “originally collected by William Staveley, esq. barrister at Jaw, now first offered to the public from the author’s ms. with very large additions and improvements, &c.” It is somewhat singular that Mr. Farmer should mistake the name of Staveley, which was Thomas, both in these proposals and in the imprimatur which he obtained for it in 1767. That however he set about this work with full intention of pursuing it with diligence, is evident from the tenour of many of the letters which he addressed at that period to some eminent antiquaries, his friends; but, in a very few months, he began to perceive that the task he had undertaken was much more lahorious than he had at first imagined. He. 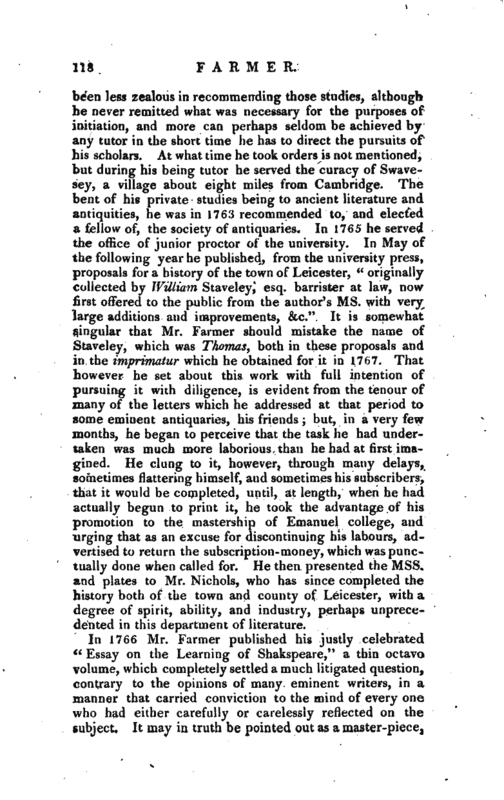 clung to it, however, through many delays, sometimes flattering himself, and sometimes his subscribers, that it would be completed, until, at length, when he had actually begun to print it, he took the advantage of his promotion to the mastership of Emanuel college, and urging that as an excuse for discontinuing his labours, advertised to return the subscription-money, which was punctually done when called for. He then presented the Mss. and plates to Mr. Nichols, who has since completed the history both of the town and county of Leicester, with a degree of spirit, ability, and industry, perhaps unprecedented in this department of literature. In 1766 Mr. Farmer published his justly celebrated “Essay on the Learning of Shakspeare,” a thin octavo volume, which completely settled a much litigated question, contrary to the opinions of many eminent writers, in a manner that carried conviction to the mind of every one who had either carefully or carelessly reflected on the subject. It may in truth be pointed out as a masterpiece, | whether we consider the sprightliness and vivacity with xvliich it is written, the clearness of the arrangement, the force and variety of the evidence, or the compression of scattered materials into a narrow com pass; materials which inferior writers would have expanded into a large volume. A second edition of this valuable performance was called for in 1767, in which are a few corrections of style; and a third was printed in 1789, without any additions, except a note at the end, accounting for his finally abandoning his intended publication of the Antiquities of Leicester. It was afterwards added to the prolegomena of Steevens’s Shakspeare, 1793, 15 vols. and in the two subsequent editions of 21 vols. by Mr. Reed in 1803, and Mr. Harris in 1812. In 1767 Mr. Farmer took the degree of B. D. and in 1769 was appointed by Dr. Terrick, then bishop of London, to be one of the preachers at the chapel royal, Whitehall. During the residence in London which this office required, he lodged with the celebrated Dr. Askew, in Queen’s Square, Bloomsbury, and became himself a collector of books at a time when such as are now thought invaluable could be picked up at stalls at the most trifling prices. 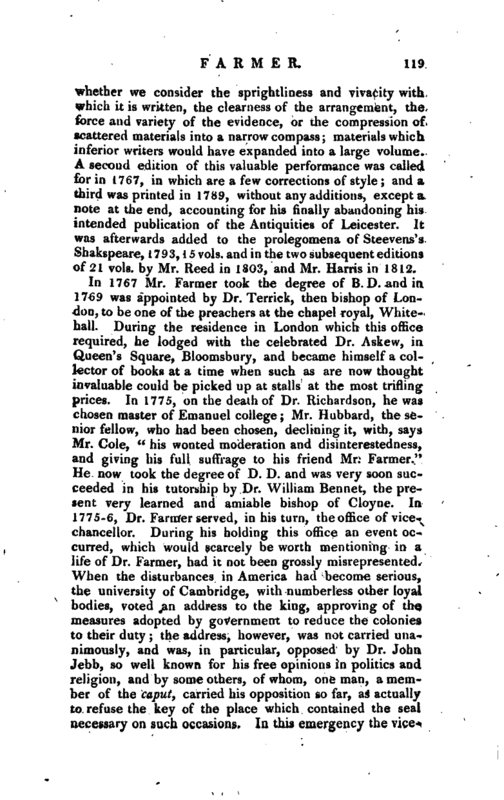 In 1775, on the death of Dr. Richardson, he was chosen master of Emanuel college; Mr. Hubbard, the senior fellow, who had been chosen, declining it, with, says Mr. Cole, “his wonted moderation and disinterestedness, and giving his full suffrage to his friend Mr. Farmer.” He now took the degree of D. D. and was very soon succeeded in his tutorship by Dr. William Bennet, the present very learned and amiable bishop of Cloyne. In 1775-6, Dr. Farmer served, in his turn, the office of vicechancellor. During his holding this office an event occurred, which would scarcely be worth mentioning in a life of Dr. Farmer, had it not been grossly misrepresented. When the disturbances in America had become serious, the university of Cambridge, with numberless other loyal bodies, voted an address to the king, approving of the measures adopted by government to reduce the colonies to their duty; the address, however, was not carried unanimously, and was, in particular, opposed by Dr. John Jebb, so well known for his free opinions in politics and religion, and by some others, of whom, one man, a member of the caput, carried his opposition so far, as actually to refuse the key of the place which contained the seal necessary on such occasions. In this emergency the | vicechancellor, Dr. Farmer, is said to have forced open the door with a sledge-hammer; and this act of violence is called courtly zeal, and all his subsequent preferments are attributed to it. But the fact’is, that the opening of this door (of a chest) was not an act of intemperate zeal. The sense of the university had been taken; the senate, by its vote, had given its sanction to the measure before the vicechancellor exerted his authority, and gave his servant his official orders to break open the chest. 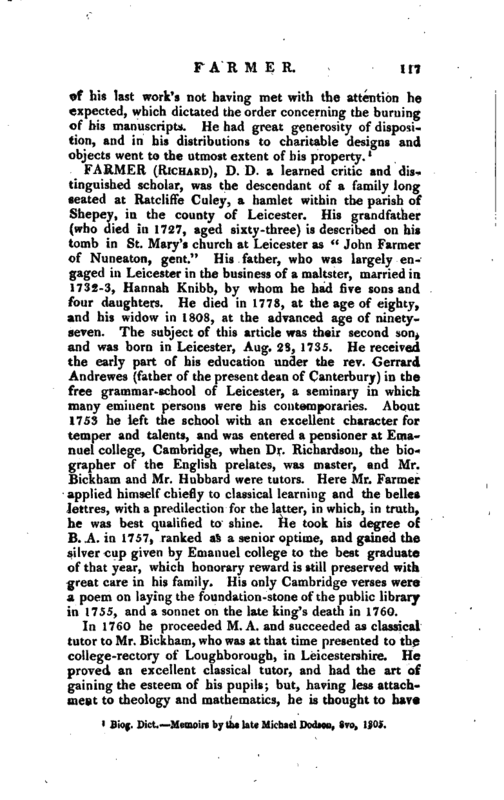 On the death of Dr. Barnardiston, master of Bene’t college, Dr. Farmer was, on June 27, 1778, unanimously elected proto-bibliothecarius, or principal librarian of the university, to which he was well entitled from his literary character, and in which office he afforded easy access to the public library to men of learning of all parties, an obligation which some have not repaid by the kindest regard for his memory. Not so the late Mr. Gilbert Wakefield, who, besides other grateful notices, says, in p. 94 95 of his Life, that he is “acquainted with striking instances of liberality in Dr. Farmer towards those of whose integrity he was convinced, however opposite their sentiments” a character, which, although Mr. Wakefield is here speaking of the mastership of the college, may be applied to Dr. Farmer throughout the whole progress of his life. In April 1780, Dr. Farmer was collated by bishop Kurd, then bishop of Lichfield and Coventry, to the prebend of Aldrewas, and the chancellorship annexed, founded in the cathedral church of Lichfield. In February 1782 he was made prebendary of Canterbury, as it is supposed, through the recommendation of the then first minister, lord North, which he resigned in 1788, on being preferred by the late Mr. Pitt to a residentiaryship of St. Paul’s. A few hours after this appointment, he jocosely said to his friend Mr. Nichols, ’ I could now, if I thought proper, cheat the minister, for I have in my pocket an appointment to the residentiaryship of St. Paul’s, without having resigned the prebend of Canterbury." Dr. Farmer had now attained the utmost of his wishes; and although both an English and an Irish bishoprick were offered to him, he declined them, for which various reasons have been assigned. One is certainly erroneous. It has been said “that in early life he had felt the power of love, and had suffered such a disappointment as had sunk deep in his mind, and for a time threatened his understanding. | From that period, though he retained his faculties entire, he acquired some peculiarities of manner, of which he was so far conscious, as to be sensible that they would hardly become the character of a bishop; being likewise strongly attached to dramatic entertainments (which, if we mistake net, the English bishops never witness), and delighting in clubs where he could have rational conversation without state or ceremony of any kind, he very wisely preferred his residentiaryship to the highest dignity in the church.” What is here said as to his habits being incompatible with the character of a bishop, cannot be denied; but these habits were partly natural, from indolence and a love of ease, and partly acquired by a seclusion from polished society. The lady to whom Dr. Farmer is said to have been attached, was the eldest daughter of sir Thomas’ Hatton, with whom he became acquainted while curate of Swavesey. Cole says, sir Thomas refused his consent, and this refusal appears to have been given in 1782, when Dr. Farmer was in his forty-seventh year, and if, as Cole affirms, the lady was then only twenty-seven or twenty-eight years of age, she must have been an infant when Dr. Farmer became acquainted with her father. 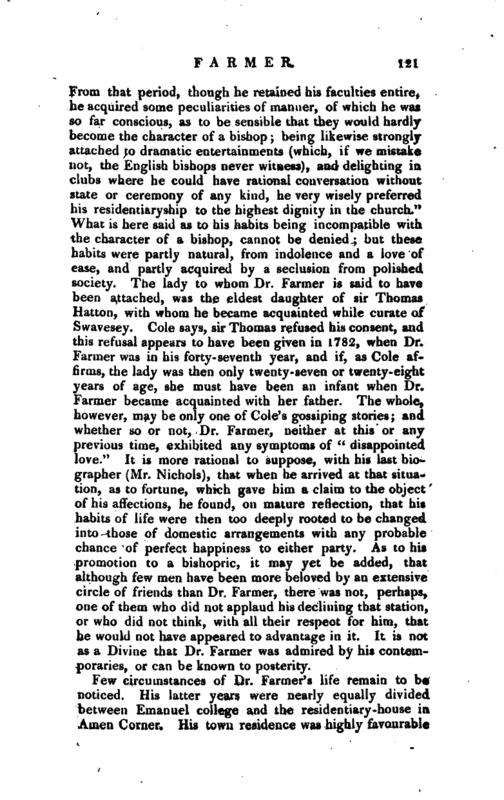 The whole, however, may be only one of Cole’s gossiping stories; and whether so or not, Dr. Farmer, neither at this or any previous time, exhibited any symptoms of-“disappointed love.” It is more rational to suppose, with his last biographer (Mr. Nichols), that when he arrived at that situation, as to fortune, which gave him a claim to the object of his affections, he found, on mature reflection, that his habits of life were then too deeply rooted to be changed into those of domestic arrangements with any probable chance of perfect happiness to either party. As to his promotion to a bishopric, it may yet be added, that although few men have been more beloved by an extensive circle of friends than Dr. Farmer, there was not, perhaps, one of them who did not applaud his declining that station, or who did not think, with all their respect for him, that he would not have appeared to advantage in it. It is not as a Divine that Dr. Farmer was admired by his contemporaries, or can be known to posterity. Few circumstances of Dr. Farmer’s life remain to be noticed. His latter years were nearly equally divided between Emanuel college and the residentiary-house in Ameu Corner. His town residence was highly favourable | to his love of literary society, and for many years he was a member of different clubs composed of men of letters, by whom he was much esteemed. He died, after a long and painful illness, at the lodge of Emanuel college, Sept. 8, 17^7, and was buried in the chapel. His epitaph in the cloisters was written by Dr. Parr, who, in another place, and while he was living, said of him, “His knowledge is various, extensive, and recondite, with much seeming negligence, and perhaps in later years some real relaxation; he understands more, and remembers more, about common and uncommon subjects of literature, than many of those who would be thought to read all the day, and meditate half the night. In quickness of apprehension, and acuteuess of discrimination, I have not often seen his equal. Through many a convivial hour have I been charmed with his vivacity and upon his genius I have reflected in many a serious moment with pleasure, with admiration but not without regret, that he has never concentrated and exerted all the great powers of his mind in some great work, upon some great subject. Of his liberality in patronizing learned men 1 could point out numerous instances. Without the smallest propensities to avarice, he possesses a large income; and without the mean submissions of dependence, he is risen to high station. 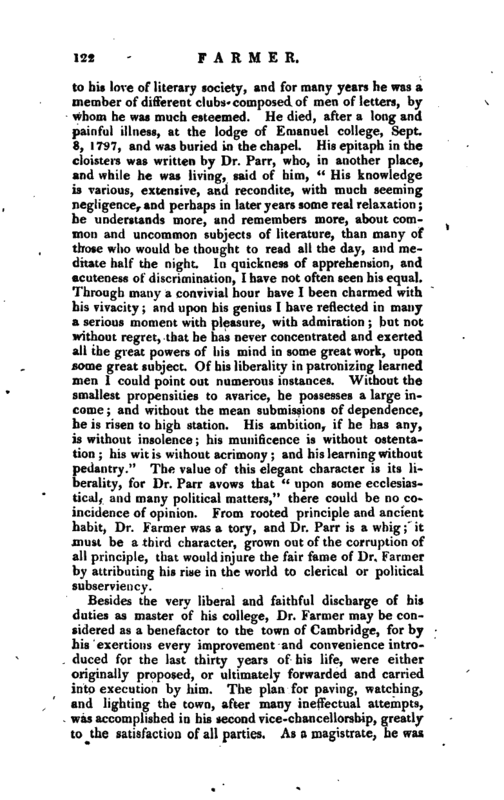 His ambition, if he has any, is without insolence his munificence is without ostentation his wit is without acrimony and his learning without pedantry.” The value of this elegant character is its liberality, for Dr. Parr avows that “upon some ecclesiastical, and many political matters,” there could be no coincidence of opinion. 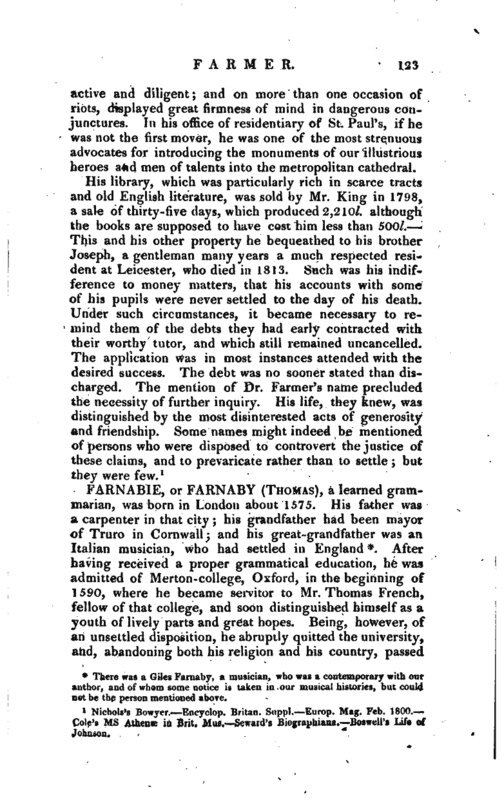 From rooted principle and ancient habit, Dr. Fanner was a tory, and Dr. Parr is a whig; it must be a third character, grown out of the corruption of all principle, that would injure the fair fame of Dr. farmer by attributing his rise in the world to clerical or political Subserviency. 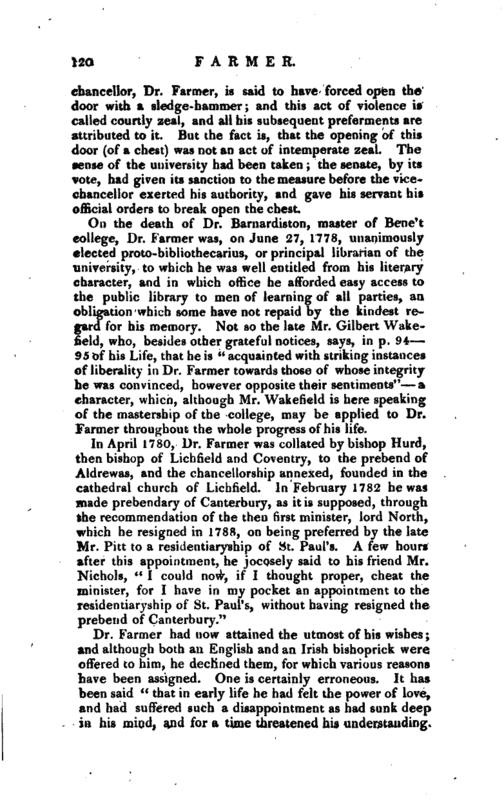 Besides the very liberal and faithful discharge of his duties as master of his college, Dr. Farmer may be considered as a benefactor to the town of Cambridge, for by his exertions every improvement and convenience introduced for the last thirty years of his life, were either originally proposed, or ultimately forwarded and carried into execution by him. The plan for paving, watching, and lighting the town, after many ineffectual attempts, was accomplished in his second vice-chancellorship, greatly to the satisfaction of all parties. As a magistrate, he was | active and diligent; and on more than one Occasion of riots, displayed great firmness of mind in dangerous conjunctures. In his office of residentiary of St. Paul’s, if he was not the first mover, he was one of the most strenuous advocates for introducing the monuments of our illustrious heroes and men of talents into the metropolitan cathedral. Nichols’s Bowyer. Encyclop. Britan. Suppl. Europ. Mag. Feb. 1800. Cole’s ms Athene in Brit, Mus. Seward’s Biographiana. Boswell’s Life of Johnson.